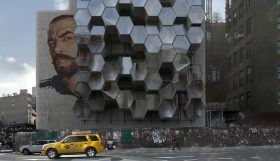 The growing population of homeless New Yorkers is sending creative agency Framlab up a wall–literally. The Oslo- and New York City-based agency has proposed a way to provide shelter for the city’s homeless in an arrangement of 3D-printed micro-neighborhoods comprised of hexagonal modules designed to attach to a scaffold structure, creating a second layer of properties, basically, alongside a building’s empty wall (h/t designboom). In the project, called “Homed,” the modular pods can be clustered together, creating a “cellular mosaic” with their fronts facing the street. 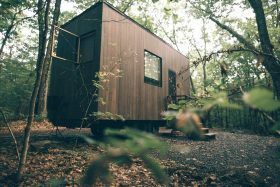 ESCAPE Homes, who build “travel-ready” tiny RVs, have put their latest offering in the Hudson Valley up on Airbnb for $145/night. Known as “The Glass House,” the super-compact, 180-square-foot getaway shares the rectangular footprint and oversized windows of Philip Johnson’s masterpiece, but other than that, this rental is one-of-a-kind. 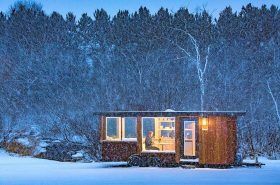 Solar powered and off-grid, it sits on 30 acres of rolling hills just 90 minutes from Manhattan and can fit a queen-size bed, fully functional kitchen, dining area, and full bath with a tub/shower in its itsy footprint.